Let’s play a game. It’s called “Spot the Fundamentals,” and the way we play it is by looking at some of the “fundamentals” to figure out which ones are responsible for our area’s high home prices. The frequent condescending argument of the cadre of Seattle area housing bulls (real estate agents, “analysts,” the press, and increasingly combative blog commenters—whom I suggest we all ignore) is that unlike most of the rest of the nation, Seattle home prices are firmly supported by strong fundamentals such as exceptional job growth, high-paying jobs, and increasing population, and as such will not decline. Let’s play “Spot the Fundamentals” to see how well that claim holds up. The Seattle area has “strong job growth,” right? Unfortunately for the Bull Cadre, a 3% increase in jobs does not account for an 11% increase in home prices during the same time frame. As we have previously explored in detail, job growth (and reduction) in the Puget Sound has had little to no correlation with housing prices. Yeah, but even though the job market isn’t growing by leaps and bounds, thanks Microsoft, salaries are shooting through the roof… right? Hmm, maybe not. In fact, income growth in the Seattle area was so slow recently that we made it onto a “lowest of” list. Somehow I must have missed it when that little news tidbit hit the papers. Another swing and a miss for the Bull Cadre. Well, people are moving here faster than ever, so that pretty much forces home prices higher, doesn’t it? Not. If there actually were people moving here in droves, then yeah, that would explain home prices rising an average of 9.4% per year (King County SFH, 2000-2005). However, that clearly does not describe reality. Looks like strike three for the Bull Cadre. As I have demonstrated before, Seattle area rents (which are not subject to speculation) have indeed been tracking fairly well with “the fundamentals.” Home prices clearly have not. How anyone can (with a straight face) argue that “strong fundamentals” will prop up Seattle area housing prices, when they have so clearly been propelled by factors other than fundamentals, is completely beyond me. You can believe whatever you want to believe about where prices will go from here, but to say that they will be propped up by “strong fundamentals” is just willful ignorance, in my opinion. If anyone believes they can explain how Seattle home prices have actually been tied to fundamentals since 2000, and wishes to civilly bring such an argument to the table, backed up by hard data (such as what is found in this post), then by all means be my guest. However, don’t waste your time with one-liners, “bitter renter” put-downs, and simplistic observations of inventory and ongoing price increases, as they will be ignored. Thanks go out to reader Dennis O. for pointing out some of the data in this post. Were’nt they the ones always going on about fundamentals and how special we are, compared to the rest of the peon nation. Thanks for the data, Tim. This is exactly the kind of data/info/argument we want the blogger to bring to the table: clear, reliable, and verifiable. Not some kind of cherry picked, bogus, or distorted data for self serving purpose. Thanks for posting, glad I could contribute. I have to say, without any graph to show, my company has announced a hiring freeze here in seattle for the entire year for sure and possibly next year as well. We were going to add 1500-2000 employes. Just another tidbit to support the data. Seattle (they also lump in Tacoma with us) is ranked as having the 15th highest income in the whole nation. Sorry, but that pretty much says it all. Even if income growth wasn’t as fast as some places, the actual raw income was so much higher then nearly everywhere else. Most of the cities ranked higher then us were in the most expensive areas of CA where the median home price is almost double. So what you’ve done is show us that we actually have incredibly affordable housing for a city in the top 15 income bracket of the entire nation. Where they hell are these places? It’s obvious the “growth” they experienced was from minimum wage to maybe 30K a year. A big percentage of growth, but the actual income is a fraction of what we have in Seattle. 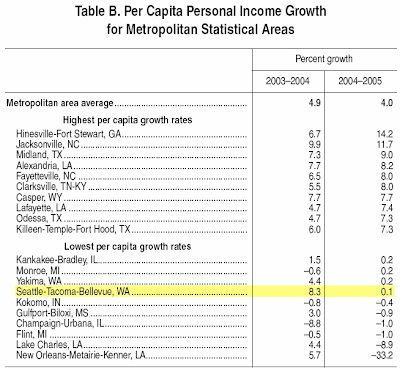 For example…Hinesville-Fort Stewart, GA was rated highest for growth. But ranked 344 in the nation for income ($26,879.) Try living in Seattle on that! Shug’s right on this one…although I disagree with most of his statistics also. but just the fact that Seattle dropped so much is very telling also. Almost like incomes have reached a plateau within some of these industries that are supposed to “carry” Seattle. What a beautiful refutation of the bull argument. The last graph says it all. The only “fundamental” for the PNW market is…. …a rapid rise in speculators. I think Tim’s point was we are not experiencing a rise in incomes. The bull argument is that we are experiencing a rise in high paying jobs, and that is justification for the higher home prices. Stable incomes equates to stable home prices. 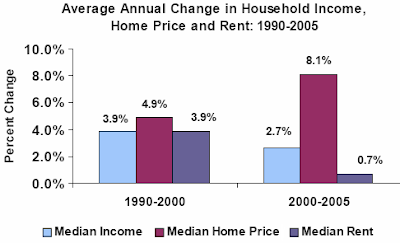 Our home prices are increasing in the face of stagnant incomes. Agree with E. the mantra has been “jobs jobs jobs” and the truth is, we aren’t creating so many – and the ones we are creating must make less then the ones we have… because the average is going down! Great job Tim. The data clearly shows that fundamentals had NOTHING to do with the hyperinflation of housing prices. Of course, myopic dolts such as meshugy will continue their blather, but nothing short of a laryngectomy would shut them up. Another thing I would say about Tim’s statistics is that the bar graph with rent and home prices makes perfect sense in a normal market. One of the greatest sources of home buyers is not people who have moved here recently or who have suddenly received a pay raise, but rather renters that have been here a while and finally either got a sufficient amount of money to feel comfortable making a down payment and buying a house or liked the attractive interest rates of the last few years. Therefore, the supply of renters is going down, causing rents to stay flat or decrease, and the price of houses is going up as the demand for buying increases. I am one such person. I have lived here since 1998 when I came to work for Microsoft. I chose to rent until 2005 because I liked to move around as my job changed, but in 2005 I liked the interest rates, I had a chunk of money in the bank for a down payment (I am not an ARM or interest-only fan and opted for a traditional 20% down and 30-yr fixed mortgage), and I was ready for a house. I would not have shown up in a 2005 job growth or income growth statistic, but I am one more buyer added to the pool that year, and I knew many others like me. Now the balance may be tipping back the other way, and renting is attractive for many because they can’t buy something as nice as what they can rent. However, maybe more interesting than this year’s job growth statistics is how has job growth over the last few years been and particularly how many renters have been added to the area over the last few years that may potentially become buyers if the interest rates stay low and they build up enough money for a down payment. You left out that fact that every homeowner is issued a brand new pretty pink pony at closing. Oh, and the houses are made of chocolate, the silkiest, most delicious chocolate in all the land. Seattle is mostest specialist place in the whole wide world!!! Flamer, you crack me up. I think that’s a great point. I mean, how many ponies can you get for that kind of scratch? One, maybe? I doubt it’ll be pink, and sure ain’t gonna be pretty. Plus, I hear all the houses in Hinesville-Fort Stewart are near lots of traffic and are surrounded by frat boys. And this statistic is also meaningless because it doesn’t address income distribution. Did you know that the world’s richest man lives in Washington state? Think that might skew those income numbers at all? Let me put it to you this way – let’s say WA’s “raw income” for all citizens was $100.00. One guy made $99.00 dollars. The other 5 million citizens split the last the $1.00. One guy can afford a house. The other 5 million can’t. Raw income says nothing about fundamentals or demand for housing. I think the income growth numbers are far more useful because at least they show the change of real income growth over time for all income classes. Ok..fair enough. I’ll see you in Hinesville-Fort Stewart, GA! Tell me something. You are, ostensibly, a businessman. Would you be interested in marketing your product(s) to these growing markets? Would you be interested in marketing your product(s) to these growing markets? I won’t sell anything to them unless they have a starbucks, an organic grocery store, 2 dozen Thai restaurants, and a 10 year supply of pink pony food. and a 10 year supply of pink pony food. That’s another big difference between $eattle and Hinesville-Fort Stewart; in Hinesville-Fort Stewart you have to buy your own pony food. But in $eattle the ponies feast on the gooey, gooey gumdrops that fall from the sky. The ponies take care of themselves! Of course, waste management is another issue. You wouldn’t believe the kind of damage a pony can do after gorging itself on gumdrops all day! “The only “fundamental” for the PNW market is…. and the spring bounce will be in … foreclosures! Succinct, informative, quality references. Nice job, Tim. This sort of post is what drew me to this blog initially. And I think everyone should take your advice on ignoring folks. You will be happy to learn that Seattle DOES make it high on this list, though we only show up at #36 – near a bunch of other places some of us may never have heard of. However, if incomes stay stagnant, we still have an opportunity to go up! Go Seattle!!! Yes only the uber rich should be awarded the right to housing. All this data proves that scientifically there is no reason for housing to have appreciated here as much as it has other than the historically low interest rate environment and easy credit standards. Unscientifically my bet is on Shuggy for the massive appreciation here in the Seattle area. Shugs left Boston and the Boston area has imploded in prices. We should be thankful that Shug lives in the area. Shuggy …you should set up a donation site and hold real estate appreciation services for the masses. Kinda like the Rev. Jim Jones style. Don’t forget to serve that Kool-Aid for the mindless. Yikes, that 33% drop in salaries for New Orleans was an eye-opener for different reasons. What’s the matter, Michael/Meshugy? Do you have a problem with people from Thailand? OK, as a former resident of Hinesville-Ft Stewart GA, I’ll tell you for sure that the average income is better than $26k annually. The number is skewed down by the large number of very young soldiers (who will make, in 2007, $15-18k per year on the low end. These guys make up the bulk of the military, and earn very low salaries. But since they are transitory residents in subsidized housing, their incomes are not relevant to home buying data. I may be wrong with this, having not served in the military myself… but it was my understanding the soldiers do not change residency to where they are based? When my father was in the military in Texas in the 60s, he was still technically a resident of Washington state. Just my two cents, but probably a day late on this thread. The one statistic from March 2007 which appears to be favorable to the real estate cheerleaders is the median price increase. What is at work here is what has historically refered to as “sqare footage creep”. In other words, houses have grown dramatically in size over the years, not to mention that the quality expands during bubbles. Thus, the median price in King County may have jumped 12% for an 1800 hsf luxury condo compared to a 1700 hsf budget condo sold last year 3 miles North of downtown. Oh, I guess you noticed that developers are building much nicer condos in the downtown area each year. Same unit sales have not appreciated that much. Duh!